For Jack Campbell '68, 20 years of active involvement with the Denver Regional Alumni Chapter has sustained his connections to old DePauw friends and created new ones. Jack Campbell '68 accepts the award on behalf of the Denver Regional Alumni Chapter for “Best Monon Bell Telecast Party 2016-17 during the All Alumni Convocation at Alumni Reunion Weekend 2017. 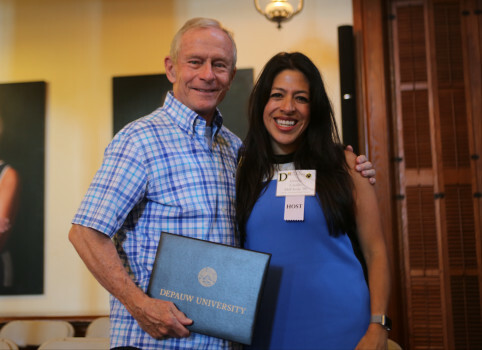 A loyal annual donor to The Fund for DePauw, Jack has stayed connected over the years through his two terms of service on the Alumni Association Board of Directors and his many trips to campus when his daughter Jennifer (Class of 2000) was a student. He looks forward to being engaged again as a DePauw parent now that Kaelyn has enrolled. Largely, though, it has been Jack’s 20 years of active involvement with the Denver Regional Alumni Chapter that has sustained his connections to old DePauw friends and created new ones. “President McCoy has also made presentations for our group in Colorado a couple of times, and we host picnics, hikes, happy hours, ski days, Rockies games and other events,” Jack said of the Denver Regional Alumni Chapter.